The Beerfordbury Barrel Tappers came into being as a sort of loose association of "folkies" from the StortFolk club in Bishops Stortford. We have to blame Jon McNamara (Mac) for the name, and a goodly part of the basic folklore. It is not so much a club as a cover for all sorts of silly behaviour, mainly to do with Carol Singing for good causes and street theatre modelled on traditional English practice. WASSAIL - going around a lot of pubs just before Christmas (and yes, we do know you're supposed to do it after, but people don't give so much loose change in early January) There are generally five nights when we tour various rural areas. We sing two or three wassail songs per pub and the regulars generally then pay us to go to the next hostelry. The group take no expenses and all receipts (except free beer) go to their chosen charities for that year - MS, Lupus, Distrophy, the Air Ambulance and local hospice services have all benefitted in the past. MUMMING - The BBTWTA started doing street theatre around 1987 at local fetes. Mac devised a modern show based on the traditional elements - fights between good & evil, death and resurrection. The lines are very largely as reported from tradition but put together so as to make an entertainment, rather than an exibit. BBT have done a lot of craft fairs and open-air events in the past. Cecil the Dragon (the scourge of all men) featured in "Clogging The Dragon" and was made flesh (or rather Hessian) by Jacqui Cresswell. 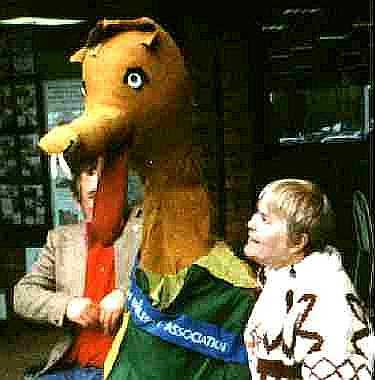 Described by the late Yvonne Mitchley as "a sort of spavined giraffe" he's a cross between a pole puppet and a morris hobby-horse. He has become something of a celebrity in his own right. In 1998 the "HITE" group from Harlow took an English translation of "Home Land" to the Jirasec Festival in the Czech Republic, with a mummer's play adapted from traditional scripts by Dave Albinson as a sort of sideshow. The effect on the local population was interesting. -- One result was that all the shops in Hronov ran out of Becherovka. (It's a long story, but true). As a number of the group could count themselves BBTWTA members, a pan-Europe Chapter was formed. In July 1999, as a result of contacts made at the festival, some of the group visited Goulburn, New South Wales with "The Booty" and the Mummers Play. Further international trips followed, to Germany and Austria, most recently to The Abtenau festival in 2014 under the auspices of Moot House Players. Beerfordbury is a Lost Village. Its former residents lost their way home after too much Bunting & Frolic at the "Temporary Sign" Inn in Loose Chippings (Near Rayleigh) and now wander the globe trying to regain the comfort of their ancestral hearths. The BBTWTA have Roamed Hither & Yon, Singing as they went. In summer they Mumm & in winter they Wassail. In 1998, they followed up a rumour that the Lost Village might actually be in Bohemia, and went with all speed to Hronov, coming back more slowly due to the Best Pilsner in the World only costing 30p a half litre. During an arduous exploration PAVEL LAHARNA was made a Hero of the Order, together with His Hon. the Mayor of Hronov, Dai Version, Doug Rowdupp and Gert Bysea. In 1999, an expeditionary committee of the Lads and Lasses Went to Oz, consequent upon news that the entire Lost Village was accidentally transported to NSW in mistake for a flatpack kitchen. Sadly all that was found was a stained fragment of a Blagdons Beer Mat, blown into a long-forgotten corner of Circular quay and uncovered during the refurbishments for the Olympics. Analysis showed it to bear an advert for "Blagdons Bogblater Special" and a draft of the last postcard sent by the ill-fated expedition in 1929 under the ledership of Billy Serck. Historians will recall that all hands were lost in freezing conditions in the vicinity of Ceejays Dunny, NSW. Despite not having discovered Beerfordbury, the commitee launched itself into an amazing number of renderings of "St George" to school and village audiences - Heroes were declared and a number of brave souls who offered support and comfort were inducted into the Australian Order of Cecil. Acting on information received, an observation recce in 2003 revealed a settlement in central Germany bearing some resemblance to the Lost Village (ie lots of beer, chaste* maidens and lusty swains) On the assumption that the entire outfit might have been purloined by agents of the Kaiser a punitive strike was secretly organised for May 2004 with the objective of terrifying the natives into a state of acquiescence preparatory to putting the local brew in a very safe place beyond all possibility of dangerous use. The result - a triumph of belief over reason, energy over dramatic excellence as the BBTWTA played Donzdorf and won 4-0. Having trekked to Salzburg and ascended an Alp or two, we found no trace of the Lost Village or the fabled Alpine Marmite. Cecil hasn't had a decent Marmite for some years and if he's not fed anything could happen ....... .
...... ..... a tour of Schwabia featured, with engagements in Stuttgart, Schwäb.Gmünd, Donzdorf, Göppingen, Geislingen, Outundinnagen, Bad Wistling, Bad Sckueezung, Bad Schoutung & Terrible Punnz. God Save the Queen & Lord 'elp the Good Burghers. Despite ourselves we couldn't help going back for another look. To our complete amazement we discovered that it occasiuonally rains in Germany, so we made valiant efforts to compensate for the wet outside by getting wet inside as well (the "wet suit" drama technique). It works ... ! The poster said that "Abtenau ist buhne" . Google says this means "Free Stage" and as we could do with an new one, we went over. Sadly the stage was already set, and full of foreign types to boot - but happily there was also an awful lot of very cold beer to sooth our dismay. So much beer, in fact that we had to return in 2014 to finish the job. See the Storfolk Page for great artists in an intimate setting! Singers & musicians always welcome. Banjo Players & Accordionists occasionally welcome. Gurdy Players skinned & pickled to order. W Suggers Hon. Ed. All comments & queries answered, Advice given, Agonies Aunted, Wassaiks done. Only high-class mumms undertook. ©2014 GeeJay Grafix for BBTWTA & StortFolk. All rights reserved.